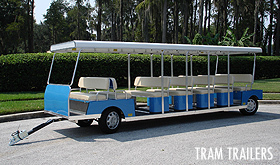 From stretched limo style golf cars, to compact shuttles, to high-capacity all aluminum tram trailers, moving people is what we do best. 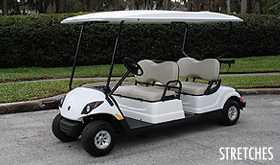 Both affordable and reliable, our vehicles are the perfect solution for transporting your clients, employees, or even VIPs from one point to another. Choose from either gas or electric powered motors and a slew of optional features and you’re sure to get a vehicle that can handle your specific needs without breaking the bank. 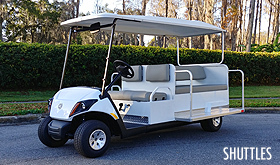 Built atop an industry-proven Yamaha golf car chassis and backed by a rock solid warranty you can purchase with confidence and reap the rewards of a sound investment.